So if you were disappointed to find that you are too late to hike the Classic Inka Tail this year (it is sold out through September now), be one of the first pioneers to make this trek with us! We are considering offering this as a 6-day trek/tour which will encompass the Rainbow Mountain trek and also include a tour of the Sacred Valley of the Inkas and a day at Machu Picchu as well! The Salkantay Trek is the #1 Alternative Trek to the Inca Trail for several very good reasons. The lan dscapes are absolutely magnificent and nature abounds, encompassing five different ecosystems which you will pass through during this trek. You will start with snow-capped glacial mountains dominated by Apu Salkantay at nearly 21,000 feet above sea level (6,271 meters) eventually descending into the lush tropical cloud forest. There are also many fewer trekkers along the way than you will find on the Inca Trail. As you may have heard, the Classic 4-Day Inca Trail is sold out now through August and most of September. Unfortunately, the Peruvian government does not allow for refunds or replacements due to cancellation for any reason whatsoever. Unless you have an advance booking, it is now impossible to hike the Classic 4-day Inca Trail through any agency. This is not due to any individual agency not having space – it is that the Peruvian government has reached its limit of 500 people per day to enter the Inca Trail through most of September of this year. Many people are turning up in Cusco without reservations and are disappointed to find that after coming all this way, they cannot get entry into the Inca Trail. Our Salkantay Trek is very special indeed, and a part of it does go along the Qhapaq Ñan. Alpaca Expeditions has created our own private campsites for the first 2 nights of camping (with our own private toilet tents as well!) 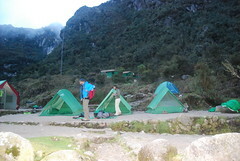 Our campsite on Da y 3 directly overlooks Machu Picchu, right below the ruins of Llactapata which we will also visit. On Day 4 we make our way to Aguas Calientes partly along the same path that Hiram Bingham took en route to his rediscovery of Machu Picchi in 1911. This night you will spend in the comfort of a hotel bed in the town of Aguas Calientes, rising early on Day 5 to witness the sunrise over one of the New Seven Wonders of the World – Machu Picchu! The Salkantay to Machu Picchu trek is considered a fairly challenging trek – many feel it to be slightly more challenging than the Inca Trail, so be sure to take a couple of days in Cusco to acclimatize to the altitude and do your best to get in shape before your arrival in Peru. We do offer 4 and 5 day treks, with the 5-day trek being a bit more leisurely than the 4-day trek. When you are checking out the various tour companies, one caveat we offer is to be sure you know exactly what you are getting. When you are perusing the internet you will find reviews from people who thought they were getting a really good deal, only to find a number of the expenses were not included – things like transportation, water, food, English-speaking guides and the like. Alpaca Expeditions takes great pride in the fact that we are Peruvian-owned and we hire locals whenever possible to help support the community. We outfit our support staff and porters with excellent equipment and offer a variety of social projects to support their villages (see our Social Projects page). Our trekking chefs continue to amaze our clients with sumptuous meals – the only complaint we’ve received is that there was too much food! Check out our reviews on Trip Advisor and you will see that over 1200 reviewers have rated Alpaca Expeditions #1! The Inca Trail’s new season starts TODAY, March 1st, 2016. Ever since Machu Picchu earned the distinction of being one of the New Seven Wonders of the World in 2007, its popularity has been increasing steadily and we are seeing people from every possible corner of the world now in Peru sporting trekking poles and camelbacks! Did you know that the Inca Trail Trek is sold out through most of August already? Many people don’t realize that there is a limit of 500 trekkers per day to start the Inca Trail, and that number includes all of the support staff – guides, cooks, and porters. In order to preserve the integrity of this famous part of what the Inca called the Qhapaq Ñan – the 24,800 mile system of paths that run through the Andes and the ancient Inca Empire and is now recognized as a UNESCO World Heritage Site – no hooved pack animals are allowed along the majority of what is now known as the Inca Trail. We therefore have to rely on people to help us carry camping gear, food, sleeping and cooking supplies. In ancient times these people were called “chaskis” that ran like lightning along these paths tag-team style, and were famed for the speed in which they could get messages across the vast expanse of the Inca Empire. 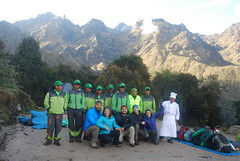 Today, for each group of 6 trekkers, Alpaca Expeditions will have 11 porters, 1 chef and 1 guide. So you can see that we need triple the number of permits to enter the Inca Trail as we have trekkers. Thus the high demand for the 500-per-day permits. Obviously, if you are wanting to hike the Inca Trail Trek in 2016, you need to make plans now! We still have all of September, October and half of November this year before our rainy season begins again in mid-November and the weather becomes a bit less predictable. We can make bookings through January of 2017 now. February 1st 2017 the Inca Trail will close for a month – February is our wettest month – during which time maintenance of the Trail is also carried out. Were you wanting to hike in Peru before August of 2016? Not to worry!! Alpaca Expeditions specializes in Alternative Treks as well! Our two most popular alternative treks are the Salkantay Trek to Machu Picchu and the Lares Trek. These less well known but fascinating treks and each have their own distinct flavor and style and fewer other hikers along the way. No permits from the Peruvian government are required for many of our alternative treks, and we are able to use pack animals, so they tend to be a bit less expensive than the Inca Trail Treks. The Salkantay to Machu Picchu trek scenery is perhaps even more stunning, and many of our trekkers feel that it is more challenging than the Inca Trail Trek. The Lares Trek offers a few more cultural opportunities than the others. It starts in the Lares Valley and offers the opportunity to experience one of the few the thermal baths or “hot springs” in the Sacred Valley area. We trek through 3 highland villages and have the opportunity to meet with some of the colorful locals whose lifestyles have been frozen in time for the past several centuries, seeing how they live and bringing a little bit of prosperity to their villages along the way. This trek also passes through the Sacred Valley and ends with a tour of Machu Picchu. There are many other alternative hikes that we offer. Some of them end in Machu Picchu but do not require permits – like the Huchuy Qosqo Trek, our Cachicata Quarry Trek and also the Vilcabamba Trek. We have a couple of other fascinating treks which do not go to Machu Picchu, for those of you who have perhaps already been and so fallen in love with the Andes you want to see more. Choquekiraw is an amazing site that many say that more resembles Machu Picchu in the years before it became so popular and touristed (we do offer one tour that does take you to Machu Picchu after your Choquekiraw trek). Ausangate mountain towers over the Sacred Valley at nearly 21,000 feet above sea level (6,400 meters) and we offer 5 and 7 day Ausangate Treks. All of these treks are detailed on our website under Alternative Treks. And maybe you don’t want to trek at all! We also offer train tours, Sacred Valley Tours, and individualized itineraries all over Peru! Regular entrance tickets into Machu Picchu don’t have such strict limitations, so we can book a train tour for you into Machu Picchu with much less notice. Now is the time to book your trip to Peru! Let us help you decide which trek or tour is best for you! Check us out on Trip Advisor and you will see that we are #1 with over 1200 reviews! Call us, chat online or send us an email if you have any questions. We promise that you will love Peru! ABOUT THE AUTHOR: Lisa has been falling in love with Peru for 11 years, and lived in Cusco permanently for the past 5 years. She has been working with Alpaca Expeditions for 2 years. She has recently written a book called “Doves Fly in My Heart: My Love Affair with Peru” available on Amazon.com. Pick it up and fall in love! The government closes the Inca Trail for all of February. Mostly because this is typically the rainiest month here in Cusco, but also for the government to do some maintenance on the trail and to the campsites. So while New Years is celebrated worldwide on January 1st, we celebrate March 1st. We have spent this month making sure our team is ready and equipped. All our guides spent time with a professor from the local university in Cusco refreshing their history. We spent two evenings at the Planetarium in Cusco reviewing the galaxy so we can help those on our alternative treks find the constellations with our new telescopes. We had a medical doctor retrain our first aid skills and park rangers review trail rules and maintenance. We even built a new campsite for our 5 Day/4 Night Salkantay Trek. Guides, porters and local villagers all worked together to build beautiful Inca terraces and plant local flowers around. We hope you will all enjoy. But it wasn’t all work. We had an amazing party celebrating what a wonderful and successful year we had in 2015. We brought more porters and their families to Machu Picchu to introduce them to the place they have worked so hard for others to visit. We visited some of our porters homes with food, boots and supplies for their kids to use in school. Yesterday we had our final meeting with park rangers and about 70 of our porters (we have close to 300 total now). We reviewed the maintenance of the equipment, how to properly dispose garbage and waste, and how to communicate with our clients without speaking the same language. Then we enjoyed a feast. Our team also spent time resting and enjoying time with their families. They are now rested and ready to make 2016 Alpaca Expeditions best year ever. We know that we could not do an amazing job without our team, and we think we have the best and happiest in Cusco. We are so excited for you to meet them. For those of you coming from the northern hemisphere, this will be especially interesting. With the South Pole facing the galactic center of the Milky Way, the southern skies provide a much brighter white stripe of the Milky Way – and the majestic Large and Small Magellanic Clouds (our Milky Way’s satellite galaxies).A northern observer will see things topsy-turvy when looking at the southern skies – familiar constellations seem upside down – but getting a glimpse of Crux, the Southern Cross, which is the smallest and the most famous constellation in the southern hemisphere (it is displayed on the New Zealand, Australian, and Brazilian flags) is a thrill that reminds you how dependent we used to be on the stars to navigate our way across the world. Equally impressive is the glowing band of our own galaxy – the Milky Way – with its patches of light and dark stretching across the sky. The non-luminous part of the Milky Way is called the Great Rift (or more poetically “the Dark River”); it is made of overlapping dust clouds containing about 1 million solar masses of plasma and dust situated in the Sagittarius Arm of our galaxy Differences For Northern and at a distance of about 300 light years from Earth. Around Cusco there are a lot of great bars that offer a varied nightlife – especially for tourists. However tucked in between these more popular bars there are some true hidden gems. Meeting places for the locals and expats living here and offering a type of entertainment that you won’t find anywhere else.